High Reaches Sprite’s Matilda had her kids the other night. The day was cool, but not bad. The temperatures went down with the sun. One chilled kid had to go to the house. A chilled kid is a kidding emergency. Kids are born wet, get cold, get hypothermia, stop responding to their mother and die. Still in his goat coat in the morning, the little kid is awake and hungry. He still can’t stand on the towel or the linoleum. He is no longer cold. In Matilda’s case this was complicated by the sizes of the two kids. I read once long ago that, if the developing kids share a placenta, one can get most of the nutrition and get large while the other one is small. This is what I faced that night. The larger doe was up on her feet, drinking milk and doing well. Such a kid is not a good house guest. Such a kid needs a goat coat, a sheltered place to sleep and will do fine. The kid needs to eat frequently so he went to town with me. He enjoyed being at the laundromat as the rough texture of the indoor outdoor carpet was made for walking on. When he got home, he could handle the linoleum. The smaller buck was second born. He got cold. He shivered for a time then stopped. He spoke to his mother for a time and stopped. Drying this kid off didn’t help. 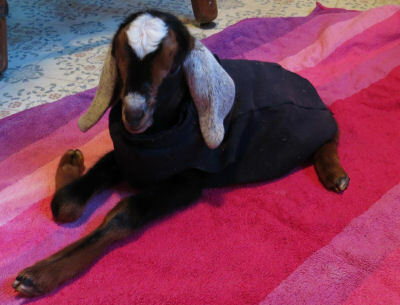 Putting a goat coat on him didn’t help. He refused to eat. He had to get warmed up. I had a choice to make. If I took both kids into the house, the larger one would be lively and unhappy. However, Matilda would take both back in the morning. If I took only the chilled kid inside, Matilda would assume she had only one kid. I would be stuck with a bottle baby. The little buck’s sister got to spend the day out in the barn. Matilda mostly left her parked in a corner while she went out to graze. The sister sniffed noses with her brother, but doesn’t know him. Hopefully they will be playmates in a couple of weeks. He has lots of red on him. She is deep black with white star, frosted ears and nose. The lateness of the hour (nearly midnight) made thinking things through difficult. I chose to have the bottle baby. Once inside, I fitted up a box with a towel on the bottom (I have a couple dozen bath towels for emergencies such as this. ), a heating pad under plastic and another towel on top. The heating pad was set on warm, the kid was put into the box. Heating pads are a wonderful invention. Mine is old and I dread trying to replace it. This one stays on for two hours and has a warm setting, perfect for a chilled kid. In an hour the little buck was ready to drink some milk. Two hours later he wanted more. Three hours later he wanted more and I had to get up for the day. An afternoon in the garden was interesting for a short time for the kid. He enjoyed basking in the sun. He’s already nibbling at things although eating is a couple of weeks away. Mostly he found gardening rather boring. I wish he could help pull weeds. There are several problems with bottle babies. One is how often they need to eat for a few days. As I had to be in town most of the day, the bottle baby went to town. 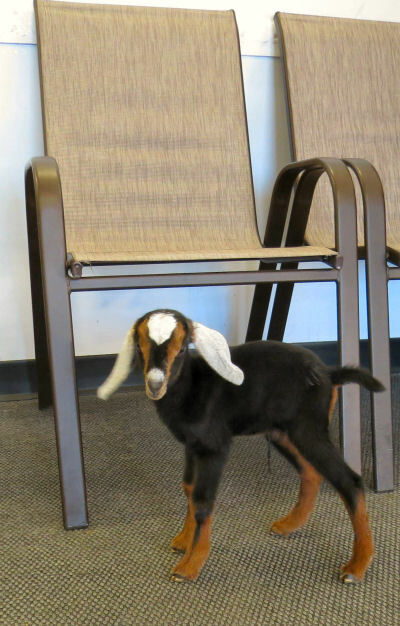 He had a wonderful time learning to walk on the rough carpet in the laundromat. At home the little guy is off and running. The linoleum still gives him some problems, but the wood stove is a great nap spot. The floors are scattered with towels as baby kids are prolific producers of yellow rivers. My next trip to the laundromat will include at least a dozen towels. The chilled kid is now doing fine. His name has changed from Pest to Holy Terror. My cats agree as they vacate the house ceding it to him. Poor Harriet faces her own goat emergencies in “Capri Capers.” Find out more on the sample pages. 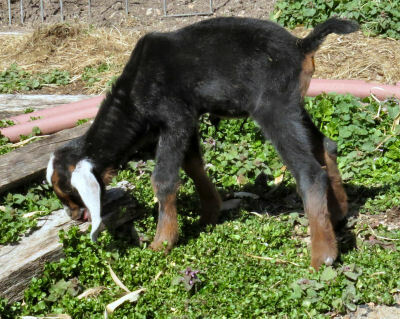 This entry was posted in High Reaches and tagged dealing with a chilled kid, goat kid in the house, raising a bottle kid on March 20, 2019 by [email protected].